Size of Baby: A mango…about 6 inches and 8.5 ounces! Total Weight Gain/Loss: I weighed myself this morning just to see for this. 🙂 I’m still about even…not gaining but not losing now. 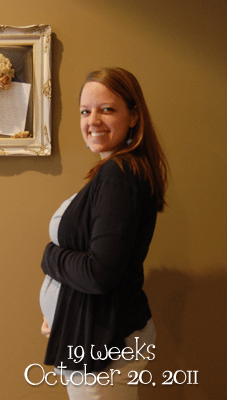 Maternity Clothes: Still the same…mostly maternity pants (except for jeans, which still fit fine for some reason), and a few shirts too! Movement: The kicks are definitely getting stronger and more frequent! She has her little “spurts” where she goes crazy for about 30 minutes, then I won’t feel her again for a few hours. She’s usually most active first thing in the morning and in the afternoon/early evening time…but lately she’s been moving around when I go to bed too! Sleep: I figured out this week that I don’t sleep very well without the pregnancy pillow. I think it’s because I normally sleep on my stomach…I wake up on my stomach if I don’t have the pillow, which just kind of makes it sore. But as long as I have the pillow (and don’t try to take my vitamins at night) it’s good! What I am looking forward to: I get to see this sweet baby again in 2 weeks! And they should be delivering our furniture soon. Cravings/Aversions: Still with the meat…it’s not as bad, but anything with meat still grosses me out. Symptoms: I figured out this week that what’s left of the “morning sickness” is just getting sick from taking my vitamins the night before. As long as I take them with dinner, I don’t get sick in the mornings anymore! I’ve got this weird pain right on my left hip bone that I can only figure is round ligament pain. And honestly, a little moody…stress plus pregnancy is not a good thing! Best Moment This Week: Feeling those stronger kicks!